Evan Thor (BBA, ‘10) was recently named the 2016 recipient of the Canadian Association of Business Students (CABS) Alumni Achievement Award for his significant contributions to the betterment of business student life, being a role model in his community and an ambassador for CABS. CABS represents over 70,000 business students from 32 universities across Canada, striving to support and improve their undergraduate experience through the development of their respective student groups. Thor was honoured in late February at their annual keystone event and Canada’s largest student-run conference, the CABS Roundtable, in Calgary. The award was then presented to him in person at the Lazaridis Students’ Society annual Year End Gala with his wife and fellow alumna, Janette Thor (BA ’07), joining him in the celebration. Below is an excerpt of the interview posted with permission by the Canadian Association of Business Students (CABS). A graduate of the Lazaridis School of Business and Economics at Wilfrid Laurier University, Evan got his start with the Lazaridis Students' Society, then called the School of Business & Economics Students’ Society, as a first-year representative in fiscal year 2007. He then spent two years as the organization’s VP external before becoming president in 2010. Outside of the student society, Evan also hosted two CABS Events, ECLR (Eastern Canada Leadership Retreat) 2009 and JDC (Jeux du Commerce) Central 2011. As a young organization at the time, CABS benefited immeasurably from Evan’s efforts and investment. Today, Evan is a proud father, husband, homeowner and professional, and continues to be a big supporter of CABS, from speaking at events to offering advice and insight to the current management team. We hope to see him at ECLR 2016, which is being hosted by his alma mater, where he will have the opportunity to continue to inspire our future business leaders. CABS: What is your current occupation or role? Evan Thor: I'm currently in Advertising Operations with BlackBerry. I've been with the company for over five years in various roles across hardware engineering, corporate communications and events, software business services and now sales for the last year. Our Ad Ops team manages BBM's advertising business from soup to nuts, coordinating with our developers and product managers to build technical systems and creating processes to enable our sales and operations teams to get advertising campaigns live quickly and efficiently. It's a complex and rather technical industry so there are many complex challenges that require an enormous amount of brain power (and data) to work through. Almost every day, there is a new issue that needs to be resolved, and it's been incredibly challenging and equally rewarding. CABS: What motivated you to get involved on campus? Evan Thor: As long as I can remember, I've not been the type of person to do what I'm told. In elementary and high school, I found activities outside the classroom far more interesting, challenging and valuable to my learning and development than the core curriculum that I was told I should be focusing on. It was one thing to learn theory – it was another thing entirely to take something very real, make a complete mess of it to learn how it works, and maybe, just maybe, be able to make it better. Getting involved at university was a natural progression of this attitude, but with a much wider range of opportunities and benefits than I had ever considered. CABS: What was your favorite part about being involved beyond the classroom at your university? Evan Thor: Growth and practical learning. I remember a number of times in fourth-year business classes where the professor was lecturing about a concept that I had never formally studied but had encountered practically in a situation with the Students' Society. Being able to immediately apply that practical situation to the concept made both the lessons I had learned in practice and in class more useful. To some degree, running programs for the Students' Society (and later the whole organization) while studying undergraduate business brought a whole new level of context to the curriculum. It not only made it easier to remember come exam time, it gave me an outlet to test and experiment with the things I was learning and get the most from my education. CABS: What would you consider to be your greatest accomplishment as a student executive? 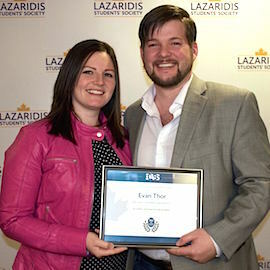 Evan Thor: For me, over my three years as a student executive, organizational stability for the Lazaridis Students' Society was likely my most important achievement. When I joined as a first-year rep, we were very small, we had no money and we ran a few events and sold some merchandise. Thanks to some incredibly intelligent, strategic and visionary presidents before me, we grew astronomically over my first three years. When I became president, the organization was virtually unrecognizable from the one we had been three years prior and my main goal was to stabilize the organization for the future. Among these achievements, we updated a very out-of-date constitution to provide both structure and flexibility, we instituted an open and transparent elections procedure that allowed the president (for the first time in our knowledge) to be openly elected by all business students (not just the club presidents), and we revamped our service offerings to become more relevant and useful to our students. These things cemented in place the things we had created. It brought increased legitimacy to the organization and more exposure to the student body, which continued to drive growth. When it comes to solving complex problems, I've got three years of top-notch experience from my Students' Society days that most people don't generally get until much later in their careers. This is a huge advantage and makes you an easy stand out. CABS: How has your extracurricular involvement helped you in your career? Evan Thor: Big picture analysis, 100%. It's easy to get stuck in the weeds when you're tracking down problems and it's easier to paint yourself into a corner. My time as a Students' Society executive made it painfully clear that how the pieces fit and work together is far more important than how any of the individual pieces actually work. When it comes to solving complex problems, I've got three years of top-notch experience from my Students' Society days that most people don't generally get until much later in their careers. This is a huge advantage and makes you an easy stand out. CABS: Do you have any advice for our current members? Evan Thor: Being a Students' Society executive is one of the greatest opportunities for young leaders. There are very few opportunities in life where you get so much freedom to drive an entire organization and impact the lives of others with almost no valid work experience and relatively low consequences of failure. Even though it sometimes feels the world is about to collapse around you, it's not. Memories are short in student politics and mistakes are just another part of the experience so long as you're willing to learn from them. Take risks and be ambitious. Build castles and knock them down. Do everything to learn anything you can. It may be years before your future employer gives you the freedom to shape an organization like you can right now with your Students' Society. Take advantage of it! CABS: We know business people are always working to expand their networks. What's the best way to get in touch? Evan Thor: LinkedIn. Look me up!